In a world where Amateur Radio ought to be on the cutting edge of technology, far too often hams are seen as being “old school” and “behind the times”. There is no part of the hobby where this is more painfully obvious than in that of amateur radio license study and examinations. 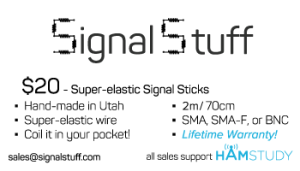 Signal Stuff is dedicated to enhancing the use of technology in the amateur radio licensing technology. With our free website HamStudy.org we provide software which finally gives aspiring hams and those wanting to progress in the hobby intelligent tools which actually help them cover the material faster and remember it more effectively. Unfortunately, free crusades like this are hard to fund and maintain; this website and the products it sells are what make that possible. Every single antenna we sell was assembled by hand by members of the amateur radio community. For more information on these antennas, read the history. Did your antenna break, or was there a defect? Request a RMA. The primary product sold by Signal Stuff is our Super-elastic Signal Sticks. Click here for more information. One thing that I think you should add to your antenna history/description is the weight of the antenna. These are so light, that they really make a difference in the feel of the radio. They feel much more stable in your hand, and are far less likely to tip over when standing up because of the weight reduction on the top end of the radio. I would guess this also reduces the strain on the connector in the radio. Good thought — I’ll add that. I believe the demo video with your little boy would be good advertisement on your site! How many need to be ordered to get a discount? Time frame? Contact us directly via email at sales@signalstuff.com to ask about bulk discounts; it’s not something we do frequently, but we can talk about it. Loved the video. Ordered an antenna today to test for our radio group. Keep up the good work! How much would shipping be to Québec City, Canada for 1 or 2 antennas? To the US or Canada shipping is $2 (USD) for one antenna, then $0.50 for each additional antenna. Above $50 USD shipping is free. To other countries you’ll have to start checking out and it will calculate the shipping costs during checkout. I was just at the checkout and its calculating the shipping at $9.50 USPS to Ontario, Canada instead of the $2.00 stated above. Is this higher shipping total correct? It is turning the $21 antenna into a $30 purchase. Unfortunately yes. The shipping method I used last year was discontinued and that is the cheapest one remaining to me that still has tracking. Even without tracking it’d be $5. No worries I appreciate your help. A great product you are making! I am wondering if you can ship the antenna to the UK? I think we can actually ship to most countries. I would have put a note on the order but didn’t see a place for that. Anyway, I needed the SMA male, I received the female. Can I exchange these? I think we are local so I could just run by and swap? I won’t pay for the shipping label if you ordered the wrong base, but I will let you swap it. Double check your order recept, though, and make sure that you really ordered the wrong thing and that I didn’t just make a mistake — I’ve never so far shipped the wrong one to someone, but there is a first time for everything. If you are local you can come swap it in person; if you aren’t you can ship it back. If I did make a mistake and ship the wrong one then email me at sales@signalstuff.com with details and I’ll send you a return shipping label. Looking at the order history I see that you did order the SMA male, and I was pretty sure I shipped you the SMA male — those are the ones that fit the Yaesus, Icoms, etc radios which have an SMA female connector *on the radio* and the antenna screws down onto a nub that sticks out. 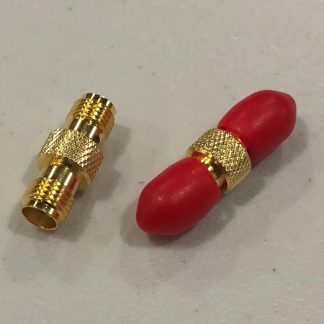 If you wanted one that fits one of the Chinese handhelds (Baofeng, Pofung, TYT, etc) then you wanted an antenna with an SMA-Female connector on it, which screws down *into* the radio. As I said, if I shipped you the wrong one despite your order then please let me know and I’ll do whatever I need to to make it right. I bought one of your sma signal sticks at the slc hamfest and love it! I also bought one of your bnc adapters to fit my baofeng. In order to hook up to my new JPole I need a male sma to male bnc adapter. Do you have one I can buy? I’m local. 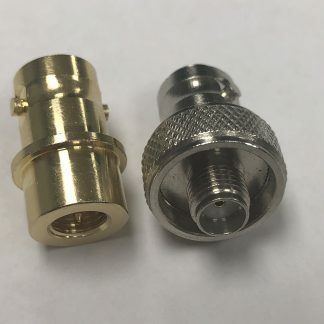 I do have male SMA adapters, they are $3 and I only ship them with an antenna (haven’t gotten them listed on the site yet). If you want to pick one up sometime that’d be fine, I’d just have to charge $3 for shipping as well and I don’t make any money on it so as a rule I don’t ship them unless it’s packaged with an antenna. Contact me at sales@signalstuff.com for things like this. Want to buy a signal stick but can’t figure out where to create an account – no links anywhere?? I’m interested in your antenna and would like to know how “stiff” it is when using it. Does it flop around or stay straight like any other antenna? There is definitely less rigidity than many antennas in our whips, though. I’m fairly confident that they do not because I believe the water proofing is around the connector on the radio and does not have any extra requirement on the antenna. That said, I don’t know for sure and you’d have to ask Yaesu about water proofing and 3rd party antennas to be certain. It seems unlikely that water could penetrate into the antenna itself, but I can’t say that it’s entirely impossible and I haven’t done any testing with actual submersion to find out. Hamstudy.org was instrumental in my passing both Tech and General exams recently. I will DEFINITELY be purchasing one of your antennas in order to pay back. However I am definitely also interested in getting a 220 version (since you said you don’t yet have a capability to create a tri-band version), as I have a tri-band HT now, and there is apparently some 1.25m use in my area. Any update on when you might release one? I suppose, in theory, I could just get two, and cut one down for 220 use? But I don’t have any kind of antenna analyzer yet to accurately do this… and I read on another post these things are apparently a beast to cut? Can you tune one for gmrs only 462-467mhz? What are the chances you’ve looked at making a tri-band 2m/1.25m(220)/70cm version? Something equivalent in concept to the Nagoya NA-320A ? I will likely start selling some 220 only antennas at some point, but tri-band is beyond my capabilities to do with sufficient quality at this point. To order go to https://signalstuff.com/product/super-elastic-signal-stick/ and choose the connector and color you want, then click add to cart. Looking at the bottom of the SMA connector, why is there such a big gap between the end of the metal. & the hole for the pin? This will not make contact with the antenna pin on my Motorola radio. 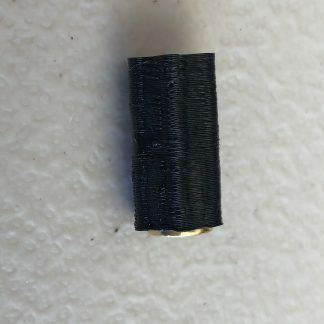 Do you make a SMA antenna where the metal at the bottom is flush with the center hole for the pin? I can definitely see your problem. Unfortunately, the problem isn’t that the SMA connector pin isn’t as deep as it’s supposed to be — the problem is that motorola seems to be using a non-standard SMA connector. The pins on standard SMA connectors actually end about 1mm inset from the lip of the connector; I will look around when we next order connectors, but I don’t know if I can get special “motorola” SMA connectors or not. There hasn’t so far been enough demand for those to make it worth doing any special builds for motorola radios, and if the pin is flush with the lip it won’t fit on many of the other radios (and may well damage the ones where you try, since the center pin isn’t expected to go that deep). I’m new to Ham Radio and purchased a Baofeng just to receive for now until I test for technician. Just ordered mine to replace the standard antenna. However I do have an off topic question, I’ve looked into the material Nitinol that you used. I have been collecting materials to DIY a Dipole. I need it to be light and easily taken down when not in use. Would this “memory wire in 2mm or 1.5mm thickness work for the antenna element? edit: when I first replied to your post I somehow misread and thought you said “jpole”, not “dipole”. Nitinol has a high resistivity; I don’t think it would work well for an antenna significantly longer than the ones we make. You could try it — I even have some long lengths of 1.1mm wire that I could sell you (I get it pre-cut now) for a reasonable price, but it’s difficult to work with because of how springy it is and I just don’t think it would perform well for you. I am trying to figure out the advantages of one of these over a Nagoya antenna. I can’t find a way to ask this more private. I would like to upgrade my antenna soon. Any help is appreciated. You can always email sales@signalstuff.com with questions, but I have no problem with answering this publicly. Lifetime guarantee — what other HT antenna can you drop your radio on, break the connector off, and send it back to get a replacement? All sales support HamStudy.org and other ham radio endeavors. Richard, my stick arrived today, Thanks! Quick question. The red cap that covers the threads, is there a trick to removing it? It seems to be epoxied on and I don’t want to break anything in the removal. I just wanted to check to see if I need to do anything special other than brute force. This happens sometimes; usually I use my leatherman to try to get it to turn in place first, then grab it and work it back and forth a bit until it comes out. I’m generally pretty careful to keep the epoxy from getting too thick, but I might have missed one. If you have too much trouble getting it off (or the cap breaks and you can’t dig the remnants out) let me know and I’ll get you a return label so you can send it back and I’ll send you a replacement. I want to thank you for this website. The way it is organized and walks you through the tests is great. The flash cards start out going through a small loop of questions, and adding more as you progress. It moves on pretty quickly as you master the information but it repeats the missed questions several times so you begin to remember the correct answers in short order. I did not realize that after passing the technician test they would offer me the chance to take the General test, so I had not studied at all for the general. I did pass the Technician test with a perfect 100% so I tried the General and missed passing it by two questions which I didn’t feel too badly about, considering I had not prepared for it. The way the system starts slowly and builds your knowledge base as you learn the material is really remarkable… at least it worked well for me! On a side note, I bought one of your antennas and it works really well… so much better than the original rubber duck that came on my FT-60! We’re glad it’s been helpful for you! 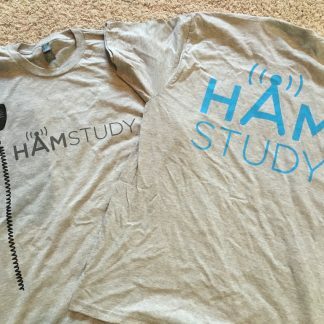 I need to contact someone in charge of the hamstudy.org website because I am having trouble registering. As a “Guest”, yesterday I went through all the flash cards and then “registered” using my email address and accepting the “Terms”. I then received a message to check my email inbox to finish the process. The problem is I have not received any message in my inbox or spam box and there was no way for me to enter a password. Today, the website says there is no account for my email address so I tried to re-register and the same thing happened. There is no way to enter a password. Please HELP! I don’t know how you do it, but these antennas are wonderful! The TX/RX is increased beyond anything I expected. Even after reading the reviews. Well worth the purchase price, and helping a great cause! We’re glad you are pleased =] How we do it is simple — we do the math, we do real-world tests, and we make changes as needed. With hundreds in use in our local area (we sold them locally for 10 years before offering them online) we’ve had a lot of feedback. Most improvements actually have nothing to do with performance, just with durability. Hi there. Just thought I’d leave a note thanking you for the hamstudy.org site. I passed my Tech, General and Extra tests yesterday all at once and I do believe hamstudy.org had a good deal to play in that. I tried to donate but it was forcing me to create a paypal account which I don’t want to do, so I decide to buy a couple of your super-elastics antennas. Anyway thanks again for the site and keep up the great work! I have not gotten a confirmation on the antenna I ordered a few days ago. Did you get the order? Queries like this are most effectively addressed to sales@signalstuff.com, just for future reference (and for any others reading this comment who may find it useful). I got my antenna a few weeks back and have a question. What is the expected impedance of the antenna at ~145MHz? I realise that the antenna is part of a ‘system’ comprising the antenna, the metal parts of the HT, and my body, to which it capacitatively couples. However I see a large disparity between the impedance presented by this antenna and another known good antenna. I took readings with a ‘tiger-tail’ 19′ counterpoise in place on the VNA to help with the missing coupling to me. It’s always interesting to see these come in, because everyone who puts it on an analyzer gets a different result =] I can totally understand your confusion, and I’ll try to answer it. The first thing to understand is that the affect of all of the other parts of the system is *significantly* greater from the perspective of the antenna analyzer than you seem to expect; if you want to get an “accurate” read of the antenna (and that term is still arguable) you will need to put a choke balun (or large ferrite) at the end of the feedline where the antenna connects. You’ll find that the length of your tiger tail will be able to change the “center frequency” by a surprisingly large amount. Different antennas are affected by this different amounts, so your other “known good antenna” is probably a significantly different design. At the end of the day, my recommendation is this: try it out in real conditions, see if it works. If you aren’t happy, you’re welcome to send it back =] We have always stood by our products and we always will… I have had a number of people express concern or even send the antennas back because of what they saw on their antenna analyzers (and each tells a different story), but it is very rare that someone is unhappy after giving it a real try. Could you share with me how you connected the antenna to the spectrum analyzer? Presumably some form of reflection bridge, but what else? I’m curious to know what I’m missing to get an accurate reading. I’ve reproduced that with several different analyzers, but that particular one was a Rigol DSA815-TG with Rigol’s overpriced VSWR bridge. I then connected a standard 50 ohm coax, ran it to a stand away from other forms of metal, and put a large ferrite bead around the coax just below the connector. I connected the antenna through a barrel (it was a BNC, I believe) and attached a tiger tail. Most likely the thing you’re missing is the ferrite; you should be able to use any type of choke balun, though. How well will this antenna work on the commercial 155. freq? Eh, middling. It’ll be usable, but probably not amazing. You could improve it by cutting about 1.25″ off the end, but that would of course void the warranty. If you plan to do that let me know in the notes and I’ll include a spare tip you can put on after clipping. I bought one of these antennas a couple of months ago – what a great antenna!! I highly recommend. Works great on my Baofengs and my Kenwood D74. I initially bought it just to support hamstudy.org, but this antenna is a must buy for your HT’s. Just got my second signal stick today for my Radioddity GD-77 handheld DMR radio. This antenna is awesome. I can work a repeater that’s about 10 miles from my home that is unusable with the stock antenna. I’ve been using one of these antennas on my Baofeng FM transceiver for a few years and they are virtually indestructible. Great antenna for a good price. Nagoya has a triband with 220 that has worked decently for me so far. It’s not lightweight and lacks many of the advantages of the signal sticks, but it does seem to work. Hi…I need one of your enhanced whip’s optimized to public safety frequencies (155-165mhz) for Search and Rescue application. Can you build me one or two of these? Needed for an ICOM 7010 so SMA Female termination. Please let me know if you can support. I don’t do custom lengths — it’s too much of a distraction from my efforts on hamstudy.org given the limited time I have — but you could convert a regular signal stick to work on those frequencies by cutting off approximately 1.75 inches from the end of the signal stick. Truth be told, HT antennas have so much variation in practical use that I’m not even sure you’d notice much difference from a stock signal stick, but that would put it closer to the “ideal” on those frequencies. I will mention, however, that intentionally cutting the wire of a signal stick is one of the few ways (if not the only way) you can void our warranty =] If you want to do that, though, let me know in the notes and I’ll include some extra tips so you can glue a new tip on after you cut it. Yesterday, I received the two 2m/70cm antennas and one 1.25m antenna and very happy with the construction and performance. The antennas can be coiled on my HTs and easily carried on my belt without having to keep removing and reinstalling the antennas which was my goal. I enjoy these super-elastic signal stick antennas. How is the fit on either a VX-8DR or the TH-D74? That wide base has me concerned about the fit. Anyone? Assuming you mean the signal stick antennas, the base is not that wide — it’s actually narrower than many antennas. I’ve personally seen it on both of those radios, you need the SMA-M.
Is there any chance you’d make any 70cm only version? I’ve got a few business band radios 400-470mhz that want new antennae but don’t need a VHF-length whip. They’re also old enough that OEM ducks are nearly impossible to find. There is certainly a chance, but I don’t have a timeline for you at this point. Wow, thanks for the speedy reply! I read the rest of the comments above and saw a few references to cutting them. I’m not going to chop the first one I order, but now that I know it’s a possibility I’m definitely going to order a few more with that intention. Your price point is not high enough to worry about voiding warranty. Cheers, can’t wait to get my first one! I have a Yaesu FT-250 handheld and wanting to connect it to a car roof-top or window mount antenna. What products to you have OR can you direct me to where I could find the them. Thanks! We don’t have any mobile antennas, I’m afraid. There are a number of different products out there each with advantages and disadvantages. The best results you’ll get of course would be from doing a full proper mobile install (drill a hole in the roof, etc), but there are magmount antennas, lip mount antennas, and many others. Note that most will do some sort of damage to your paint over time, so choose your priorities! Sorry I can’t recommend anything specific — look around on ebay, there are a lot of cheap options you can get started with, then move up to something more serious. How long does it take to reach say Quebec City (I live not that far from there), do you have any info ? Asking because I would like to get it prior to leave on Aug 24. I don’t know for sure; if you order today I’ll ship it tomorrow, and that’s 3 weeks. You’d think that would be plenty of time, but I can’t absolutely guarantee it. I don’t get reliable tracking information from USPS for shipments going to Canada, so I can’t tell you for sure how long it takes. I listen almost exclusively to frequencies between 152 to 156 Mhz. Can you make a signal stick for this frequency range. And, if so, would it be much better than your stock length? Honestly I doubt it would make much difference, particularly for receiving, but you could cut off about 1 1/8″ off of the end of the antenna to tune it just a bit better for the frequencies you’re talking about. Note that this would void the warranty (about the only thing that does). If you want to do that let me know in the order notes and I’ll include a couple of extra tips that you can glue on after you cut it down. I was wondering if you’d considered making an antenna with an NMA mount. I know I can get an SMA (or maybe even a BNC) to NMA adapter but to me they are just not robust enough for vehicle use. A thicker wire would be better for wind resistance but even the ones you have now might be better than what I now, have for the application I have in mind. That is, a roof mounted NMA antenna on my pickup that I sometimes have to drive into city garages with very low clearance. When I have to do so now, I swap my everyday center-loaded 2M/70cM antenna for a stub antenna which is really nothing more than a dummy load and preforms about the same. I’ve considered it, but I just haven’t found a good way to do it. As a workaround, you could get a NMO to UHF adapter and then use a UHF to BNC adapter to try putting the signal stick on a NMO mount; it’s probably $20 of parts is all. Never heard of NMA. Did he mean NMO? If not, please educate me. I do not have a ham license, but I like to listen to repeaters in my area. I do have a GMRS license and I use those repeaters in my area. Will your antenna still be suitable for GMRS frequencies? I am looking to buy 2 of these antennas. (I should probably use HamStudy.org and get my ham license.) Thanks! Hi! Our antennas will work reasonably well on GMRS frequencies but not amazingly well; to be perfectly honest, I can’t guarantee that they would work significantly better than the stock antenna, though I would be shocked if they didn’t work as well. You’d just have to play with it to find out; it isn’t something we really test. Hi. I recently received two BNC antennas and noticed that there is a hole in the side of the glue cap. There does not appear to be any kind of adjustment or anything like that accessible through the hole – all I see is the side of the connector. What is the purpose of the hole? I’ve been reading every article there is about the Signal Stick and watching every video that I could find about it and I came to realize that I really REALLY need one so went on to order one. However, when the postage cost part came, I had to give up =( As much as I want a Signal Stick, I can’t convince my wallet that it makes sense to pay (almost) the same for postage as for the product itself (I’m from Portugal). Yeah, I sure wish there was a better option for us. Last year we could ship them there for under $3, but that shipping option was removed this year. There is another I was using for awhile that was $5 but tracking didn’t work and after a number of disgruntled customers and lost items I decided we needed the tracking, which unfortunately meant the cheapest I could find for international ends up being around $9-$15USD :-( Note that shipping for 5 antennas is about the same as one, though, so you could try to find others who are also interested and do a group order. Sorry we can’t help more — we’d really like to. I bought one of your antennas for my dual band HT and am very happy with it. BUT, it made me want a better antenna for my Marine VHF handheld, which uses a rubber ducky antenna. Can you fashion one for 156 – 158 MHz? 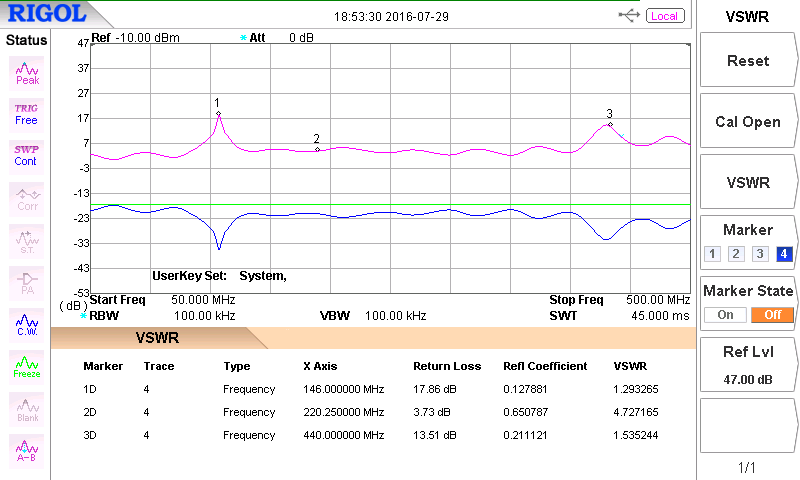 You could cut down a regular dual band signal stick to work a bit better on 157Mhz (centered on the range you want) by cutting off about 1.5″, though this is is one way (about the only way) to void the warranty. I don’t make them custom length, it’s not worth my time — we’d rather spend our development efforts on hamstudy.org. Is the newer base design for the SMA M narrow enough that it fits onto the ID51A Plus 2? I have one of the previous antennas and the hex of the base hits the GPS hump on top and won’t let it screw all the way down. Are you sure the problem is that it hits the GPS hump on top? It fits my ID-51 just fine, but I don’t have a Plus 2, just a ID-51 (US version, whichever letter that is). Most Icoms you end up with a gap under the connector because their SMA connectors have abnormally long barrels, so it’s possible that’s actually the problem. The hex cover has decreased in size slightly over the last year but I’ve never seen a radio that any of mine didn’t fit on, so I can’t be sure if it’s enough. If you order one and it doesn’t fit you’re welcome to send it back. I am looking at an antenna for my Yaesu VX6R TRIBAND. DO YOU HAVE ONE AVAILABLE FOR ALL 3? OR .. ALSO I BELIEVE I NEED A SMA-F ANTENNA? AM I CORRECT? The vx-6 has SMA-F on the radio, so you’d need a SMA-M antenna to match it. We do not have Tri band antennas, unfortunately. Hello, I work in industrial maintenance, your site is great, I used it to study for my ham licenses. I would like to find about getting your program behind your site. I know you would need to be compensated in some way for the development, but we could really use it for developing our your team members. Please let me know something. The software behind hamstudy.org is all custom designed; it could probably be adapted for specific use but it would take a little bit of tweaking. Feel free to reach out to me at support@hamstudy.org and I’m happy to discuss possibilities with you. Note that I’m having surgery tomorrow (12/12/2018) so will likely be out of touch for at least a week before I could get back with anything specific. i bought two of these recently. can you tell me why these antennas go “limp” in the cold? we’ve had temps in the single digits lately, and i do notice the stiffness deplete from inside warmth to the outside cold. Do you know about what temperature it begins to go limp? It gets cold where I live. Are your antennas marine grade? I’m considering replacing the SMA-M rubber duck on a Standard-Horizon HX870 with a trimmed Signal Stick, but don’t want salt water to get in. It’s more of a range; I haven’t done extensive testing but a good rule of thumb probably around 40 degrees F it starts to lose rigidity (that’s a bit of a guess) and the colder it gets the more it transitions into a form where you can sorta shape it how you want. Once it gets back above 40-50 degrees it’ll return right back to the original shape. We have not taken any particular steps to make the antenna watertight; I have no idea how much effect salt water would have. If you buy one and it gets ruined by salt water you can use the warranty to get it replaced (and let us see what happens). Thanks for the reply. I was more concerned with the watertightness of the SMA connection to the radio compared to the stock rubber duck antenna. I think I’ll get one regardless to use at camp. How can we contact you to get the XML and JSON files for the questions? You mentioned that they are available upon request but no place to request them. Email support@hamstudy.org and I’ll help you out! 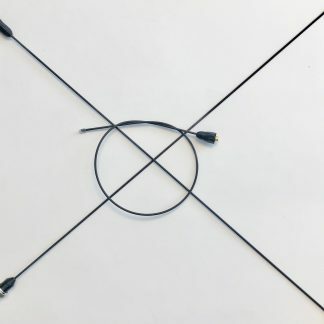 Given the antena light weight and durability, do you make longer antennas? 1/2 wave length of 2 m & 70 cm? Glad the signal stick is working well for you =] 73! I see a few comments asking for public safety, industrial and marine uses for the antennas. I understand you do not want to custom tune to order. However instead of voiding the warranty (and I don’t understand why just trimming the antenna whip would) just include a cut chart and cap for the end user to set for their frequency range. I know there are plenty of wild land fire fighters, SAR, USCG and others who would be interested in a full length VHF whip. The reason that it voids the warranty is simple — we can often reuse the wire from antennas which have been returned, but when you cut the wire that makes it impossible. Granted, there are ways that it can happen on accident and we absolutely warranty those, but if you return an antenna which has been cut there is nothing I can do to make it useful again. The wire is actually one of the more expensive parts of the antenna (if you price nitinol wire you’ll understand why). I’ll consider making a chart, it’s an interesting idea; however, adding that option would add yet another complexity to our shipping process and another place where I could make mistakes when shipping and I’m already questioning at times if it’s worth doing the spacers, since I tend to forget to include it in at least a couple of orders per month already :-) (yes, I’m working on improving my process to help with that).